The World Cup of Cricket is back again. It will take quite a few sensations for the 2015 World Cup to match the drama and emotion of 1992, the only other occasion when the tournament was held in Australia. 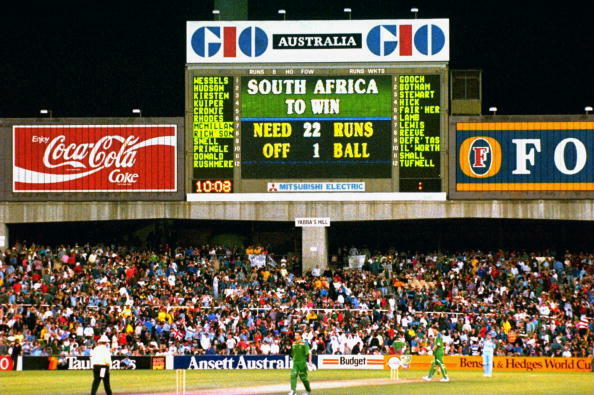 1992 may be regarded as the first modern World Cup: it was the first to involve night cricket and coloured clothing; it was reckoned that the global television audience exceeded one billion. And there was plenty going on to divert that audience. Even when it rained. Especially when it rained, which it did quite often in that late Australasian summer. If India can’t defend the glory, my bets are on the so called “Chokers“. South Africa have never reached the final of the World Cup since their return to international cricket in 1992. Yet they have always seemed capable of winning the trophy. Until something happens. As we know, Cricket is a sport entranced by hocus pocus and uncertainty. Their very first World Cup, it was the rain rule, which in the space of 12 minutes transformed South Africa’s semi final run-chase against England from well doable 22 runs in 13 balls to dead 21 runs from 1 ball, causing farce, embarrassment and heartache in equal measure. The ridiculous outcome was bad news for everyone, except perhaps Messrs Duckworth and Lewis. There were tears in the South Africa dressing room after that preposterous semi-final defeat, which denied the side a fairytale return to international cricket. One thing was sure, Proteas did not “choke”, they broke! At the 1996 World Cup South Africa and Sri Lanka were two teams that did not lose a single match in group stages and were toppers in their respective groups. 11 days before the quarter final match, West Indies had lost shamefully to the amateur cricketers of Kenya; now they faced the in-form team of the tournament, South Africa, in a quarter final encounter that no one truly believed they could win. But one warning (Brian Lara was fuming for the way he got out against Kenyans) that South Africa failed to heed, and on a cracked Karachi pitch, they made the single biggest mistake of the tournament, they omitted their spearhead, Allan Donald, in favor of an extra spinner, Paul Adams. It was a decision that Lara greeted with glee. Lara finished with 111 from 94 balls, with 16 crunching fours, before West Indies’ own spinners, Jimmy Adams and Roger Harper, sealed the deal with 19 runs to spare. You cannot blame an opponent of ‘choking’ on a Brian Charles Lara’s day. They looked good in England in 1999 winning 4 out of 5 group stage matches. 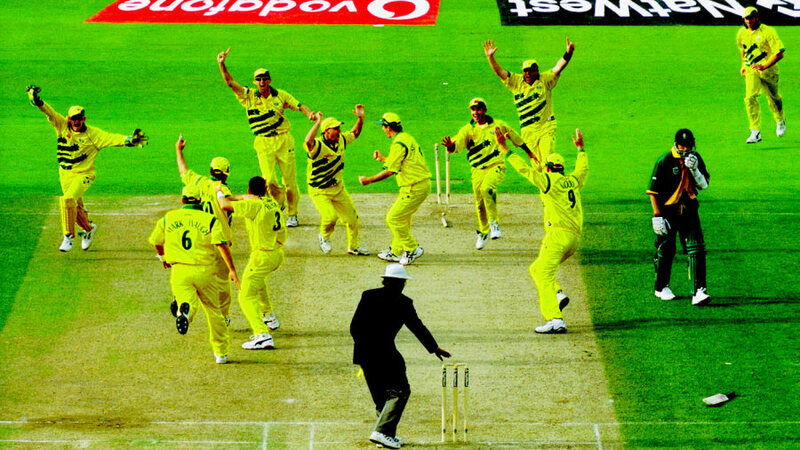 The semi-final between Australia and South Africa, easily acknowledged as one of the greatest ODI games ever played. The match had turned more times than an insomniac before the last ball. South Africa opted to bowl and Shaun Pollock and Allan Donald fired to restrict Australia to 213. South Africa, chasing 214 to walk into their first World Cup final, were 43/0, with Herschelle Gibbs and Gary Kirsten looking good when, Shane Warne turned conjurer to return with a mesmerizing spell of 4 for 29. Proteas were stunned by magical Warne. His heroics inspired Australia as they went into the last over with South Africa needing nine runs. Lance Klusener was at the crease with Allan Donald as the last company. Klusener had cut a daunting target down to a near walk in the park, one needed off four balls. Damien Fleming, having let Klusener blast consecutive fours to level the scores, tightened up. Steve Waugh, knowing a tie would be enough, set a field that gave new meaning to the phrase “a ring saving one”. After surviving a close shave off the third ball, Klusener charged at the next one. Donald grounded his bat, dropped it, and finally set off, while Mark Waugh, at mid-on, flicked the ball to Fleming, who rolled it to Adam Gilchrist, who broke the wicket and South African hearts. It was a tie! Australia went through to the final due to a superior run rate at the end of the Super Six stage. This was when the term ‘chokers’ took birth. Remember when Herschelle Gibbs dropped Steve Waugh at Headingley and the Aussie sneered, “You just dropped the World Cup”? Remember how Waugh rubbed salt into the wounds at the press conference by coining the “choker” tag? Both were wonderfully evocative moments. The trouble is, neither actually happened. Words were exchanged on the field. Later, Waugh said something about the Proteas not handling pressure well. But when it comes to South Africa’s World Cup legacy, Cricket pundits (not referring Sanjay Manjrekar) have let cricket lore get in the way of facts. There’s no denying that South Africans have found some particularly eccentric ways to leave the tournament, but do they regularly choke – that is, lose a vital game that is already mostly won? I’m not convinced. 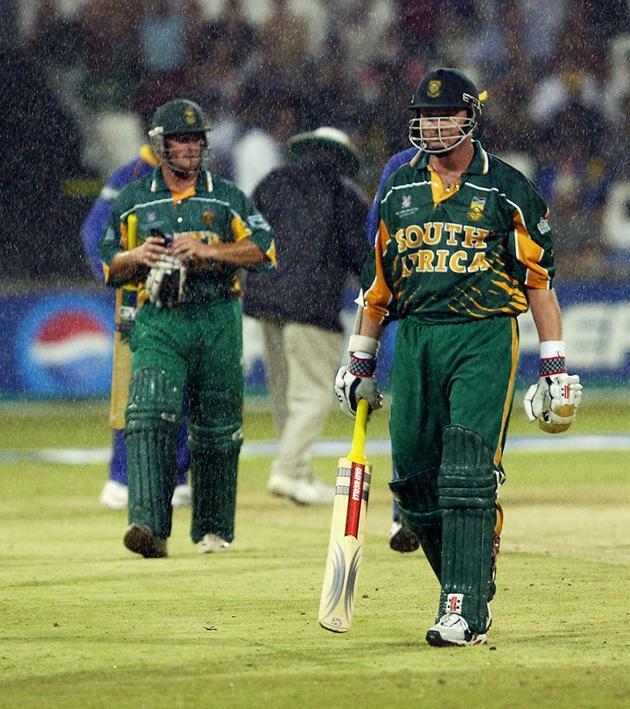 The unfortunate proteas were again not so well informed in Durban in 2003 when their batsmen, Mark Boucher and Klusener, left the ground smiling, in heavy drizzle in the match against Sri Lanka. The South Africans thought they had won on a Duckworth/Lewis calculation. It was in fact another tie, which meant that they failed to qualify. Those who called for Pollock’s head as Choker-in-Chief had forgotten why they were so shocked and angry in the first place: South Africa had it in the bag. Mark Boucher had a winning total relayed to him and had duly put Muttiah Muralitharan into the stands for six, and then declined what he thought was an unneeded single. It was a staggeringly stupid mistake by the team, but being bad at arithmetic is not the same as choking on a cricket field, and soon afterwards their captain, Shaun Pollock, felt obliged to resign. The 2007 team, likewise, could only dream of being good enough to choke. Instead, in the opening rounds, they were reeled in by Bangladesh and were briskly knocked on the head by New Zealand. South Africa’s exit from the West Indies wasn’t a choke. It was a mercy killing. While their record cannot be contested, in 2011 quarter final against New Zealand, whether proteas choked or not can be debated. There’s a fundamental difference between choking and panicking. So what exactly is choking and how is it different from panicking? Chasing a target is a lot about identifying threats and weak links in the opposition and then treading with caution against potential threats while going after the weak links. Playing in safe mode can take you only so far; you must change gears at some point. The fundamental difference is that while you think too much when you choke and try to delay the inevitable, you think too little when you panic and want to get over with it as soon as possible, for you can’t bear the growing pressure. In my understanding, what happened to South Africa against New Zealand in Mirpur was a bad case of panic, though it was conveniently considered a choke. So the World Cup has not been Proteas’ favorite hunting ground. It would be easy to write off the Proteas as they return down under, where their World Cup history began. It would certainly scratch a cynical itch to predict another semi-final travesty. But I have another thought, and here’s why. Since the 2011 World Cup, South Africa’s squad had major changes, including the departure of Gary Kirsten, the coach who took India to the World Cup title, and the retirement of stalwarts Jacques Kallis, Graeme Smith and Mark Boucher. Other teams may have been blown away by such change but South Africa only emerged stronger. They retained their form in the longest format and developed their limited-over teams. Their new captain, AB de Villiers, and coach, Russell Domingo, have molded the team by holding on to the best parts – consistency, hunger and a collection of quality cricketers – and added calmness. A clinical approach has seen South Africa criticized for lack of creativity in the past but that is slowly changing. 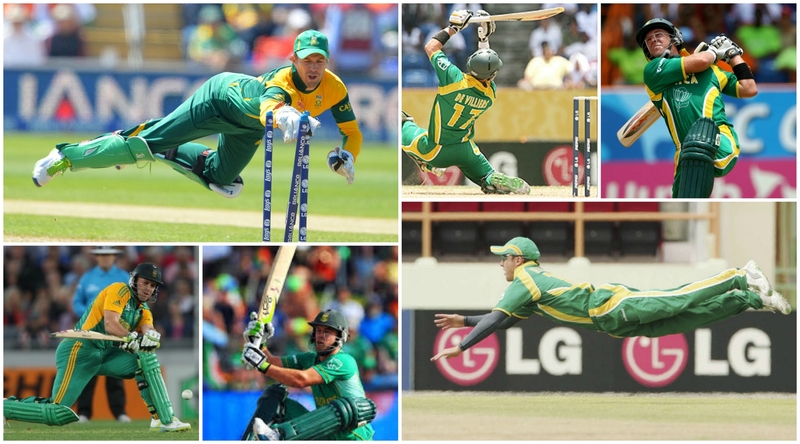 An aggressive top six that combines intent with enterprise, an arsenal of piercing pace pack equipped with the ability to move the ball and extract extra bounce, and a talented spin department means South Africa’s strength lies both in numbers and in diversity. South Africa’s leadership group includes those who have led in all three formats, which makes for an even spread of talent to take them over the line. Arguably they have the most versatile sportsman in Abraham Benjamin de Villiers leading the team. A born athlete, AB has excelled in golf and got a scratch handicap (a player whose average score for a round of golf is par or better), in Rugby he played for Blue Balls U-18 side, a premier Rugby club of SA, in Hockey made it to South Africa’s junior national hockey team, was a member of South Africa’s junior Davis Cup tennis team, ranked 2nd in his age division for tennis in South Africa and was also the South Africa’s U-19 national badminton champion. Other than that, he held six South African school swimming records in school and also held the record in the 100m dash in South Africa’s junior athletics. As a cricketer AB is a batsman of breathtaking chutzpah and enterprise despite being a magical fielder and brilliant wicket keeper when needed. The statistics have him as the best one-day international batsman in the world, since he is top of the ICC rankings, but so does the naked eye. AB de Villiers’ bat can be golf club, tennis racket, hockey stick or a magic wand – such is the range of his stroke play. AB may come across as something of a fictional superhero on the field with real doctorate in physics. The balling department is headed by the widely lauded as the best fast bowler in the world, Dale Steyn, is often the difference between South Africa and the rest. And Steyn is only getting harder to face, he enjoyed his best season of one-day cricket in 2013-14 with 21 wickets at a staggering average of 8.09. Speed and swing makes him scary enough but he also brings a snarl. In Australia where conditions that suit him, he can silence the most stoic opponents. Alongside him will be Morne Morkel, who will relish any bounce in the pitches and steady old Vernon Philander. Given the reduction of mystery spinners since the purge, the presence of the wrist spinner Imran Tahir may be a boon for the South Africans. Watch out the supremely talented players such as Hashim Amla, David Miller, Faf du Plessis, JP Duminy and Jonty Rhodes in the making Farhaan Behardien to the mix added with their ability as magical fielding side, their strength is obvious. I feel, It’s time for Africa.